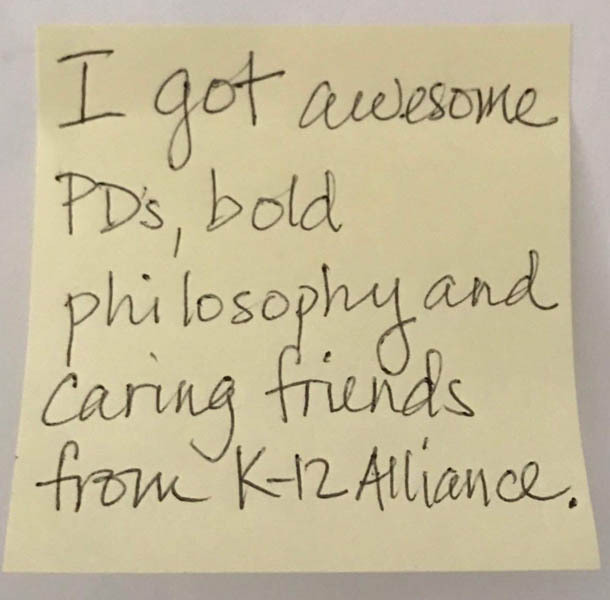 The K-12 Alliance has had a positive impact on the work that I do as a professional educator, by allowing me to experience education through the eyes of a student, as well as an adult! I have been working hard the last 3 years with an incredible group of professionals that have brought us top-notch ideas/information/creativity and other professionals to work with, as well as time, to hone our craft....it has been such a wealth of knowledge to be able to plan with colleagues and teach 5E lessons that we created, using the NGSS Standards, and then sculpt it into a more refined lesson each time we presented it. 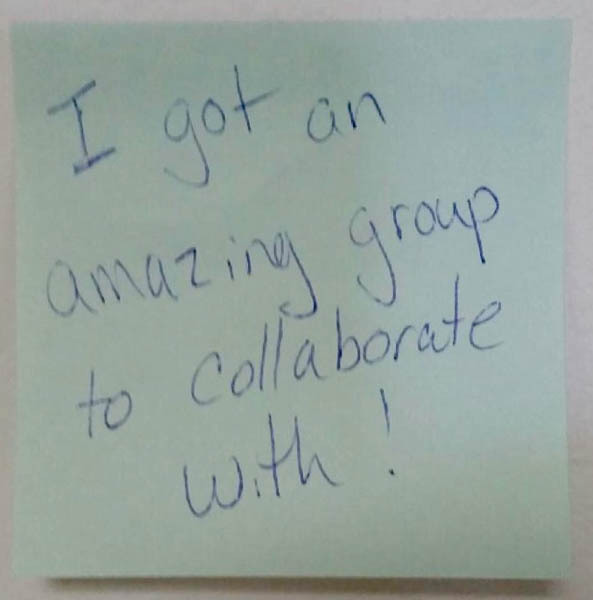 By allowing us to experience first hand how lessons are brainstormed, created and refined, I gained huge insight as to what I needed to include to make sure my own students were engaged, learning, and sharing information within their peer group! Project Prototype was the BEST 3 years of my life! The K-12 Science Alliance was a valuable partner in Dublin's transition to the Next Generation Science Standards. Teacher leaders and principals in Dublin Unified grew leaps and bounds and were pushed beyond their ZPD at the awesome summer and winter leadership retreats. Our leaders were able to train 100% of Dublin Science teachers in NGSS as a result of our partnership. As a result, Dublin is well on their way to designing instruction to implement Next Generation Science Standards. 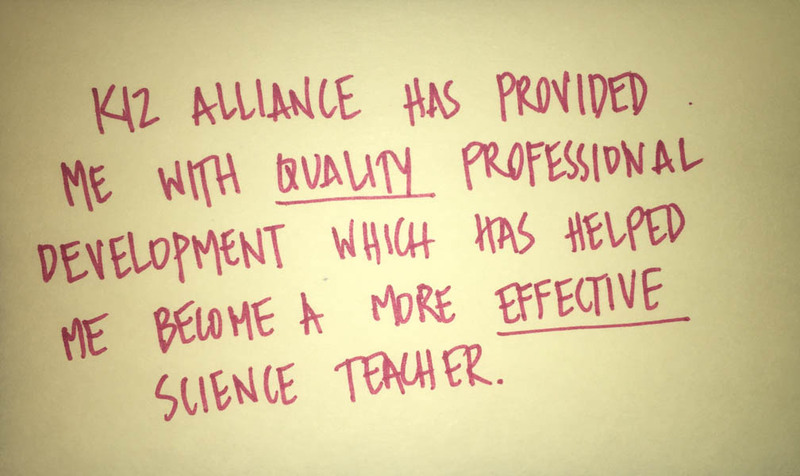 The professional development provided by K-12 Alliance has fostered a deeper understanding of inquiry based science instruction. After participating in K-12 Alliance professional development, my teachers have a stronger background in scientific content and the pedagogy of inquiry. My teachers use conceptual flows as a vehicle for planning interdisciplinary units and this has increased the rigor in those units. During our work with K-12 Alliance, we have realized the importance of sharing pedagogical shifts with the Next Generation Science Standards and what they look like in the classroom with our community. We have been able to present at meetings where we showcase how the K-12 Alliance's CA NGSS K-8 Early Implementation Initiative helped us understand how to support changes in the classroom. We are supporting each other at the ground level to create buy in. These conversations with all stakeholders have allowed us to address concerns and helped to gain additional support. 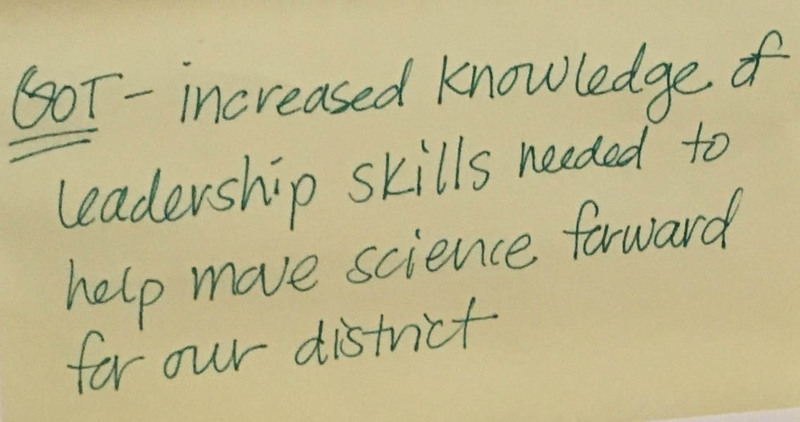 Our K-12 Alliance training, and the opportunities we have had to learn from their partners, enabled us to stress to Administrators and teachers, the importance of incorporating literacy (specifically writing) into science instruction. 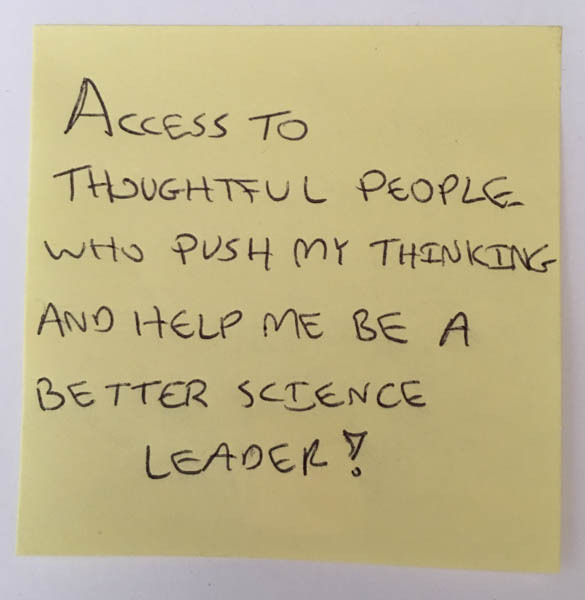 This has created a lot of interest among other Administrators who are now reaching out, wanting to know more about how we can help with their attempts to support writing in science. Learning is contagious. 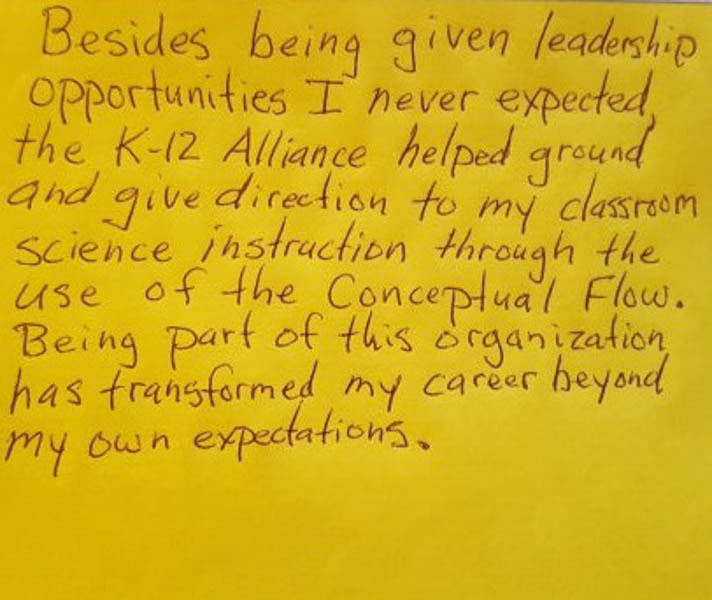 K-12 Alliance trainings advance a teacher's talents in leading student-centered inquiry activities that fosters exploration and unleashes the use of models and critical reasoning. In the pursuit of comprehending the wonders of science, these training expand the universe of curiosity and discovery. These training frame and offer perspective toward venturing into the three dimensional NGSS world of new possibilities. Herein content instruction becomes an amazing place of appreciating patterns, relationships and systems. Herein argument, insight and revising comprehension seed the next adventure of leadership and collaborative learning. Being involved in Project Prototype, where we bring engineering and science together, has enabled me to design projects where 100% of the students want to be involved because they are engaging, interesting, and allow them to work together to find creative solutions to real life situations. Through my work with the K-12 Alliance, I have increased my content knowledge as well as enhanced my pedagogical skills. 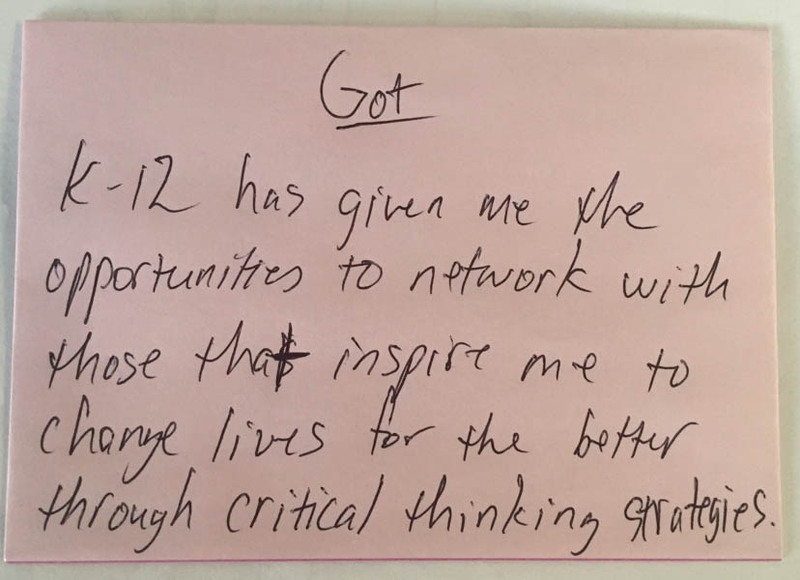 The collaborative work we experience with highly qualified, knowledgeable presenters, and the professional development we have participated in has been invaluable in my personal development as an instructional leader. 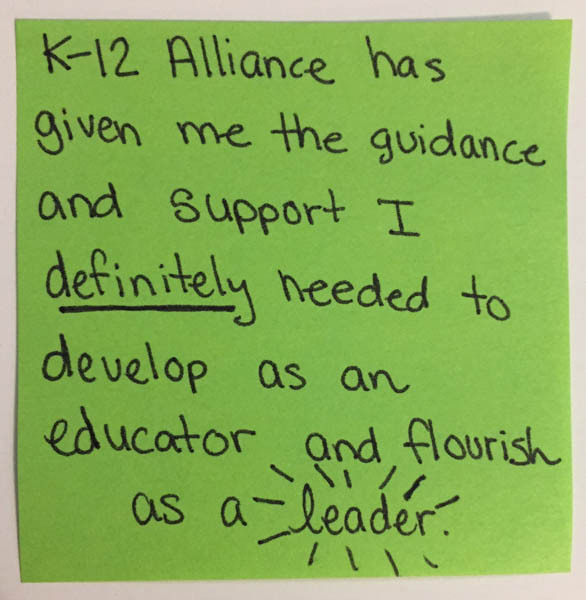 The passion of the professionals within the K-12 Alliance keeps our work research-based and on the cutting edge of science education and implementation. 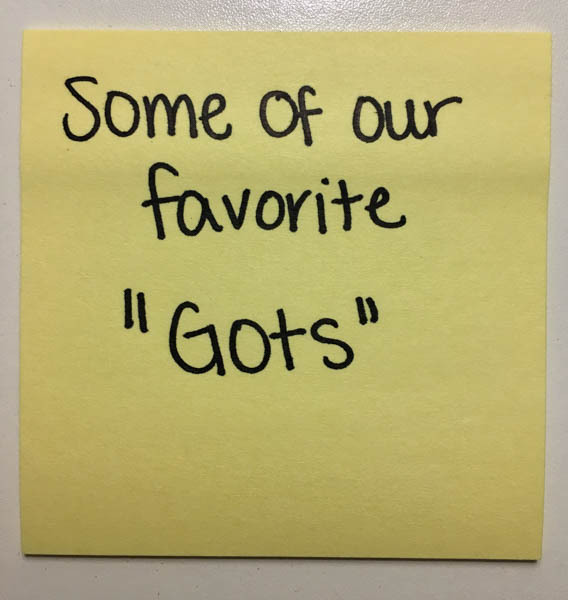 Coherence counts...the 3-dimensional 5E learning sequence we developed helped kids to build real understanding over time as opposed to a one-shot lesson that didn't connect to anything before or after. The K-12 Alliance is chock-full of excellent role models for thinking and learning as an adult. By working with them, I've been able to translate my own growth as a learner to better understand and appreciate what students need. The K-12 Alliance demonstrates how to conduct inquiry in an intentional way so that the classroom as a whole is greater than the sum of the parts (like Aristotle). 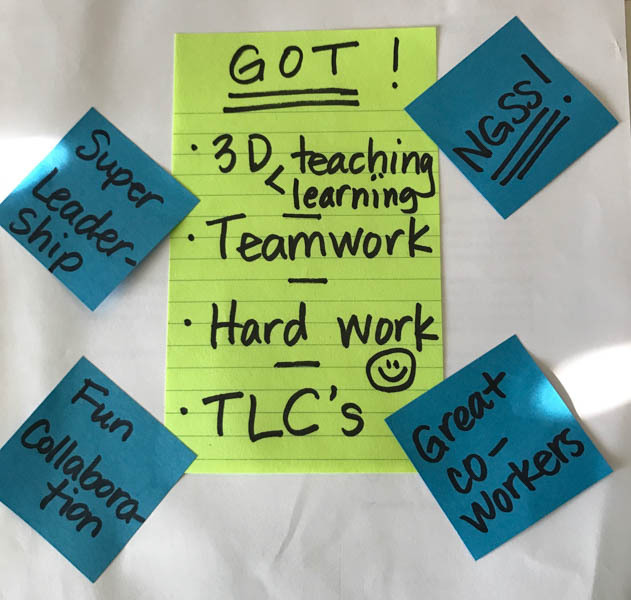 The TLC process is the best professional development my teachers have received in years. 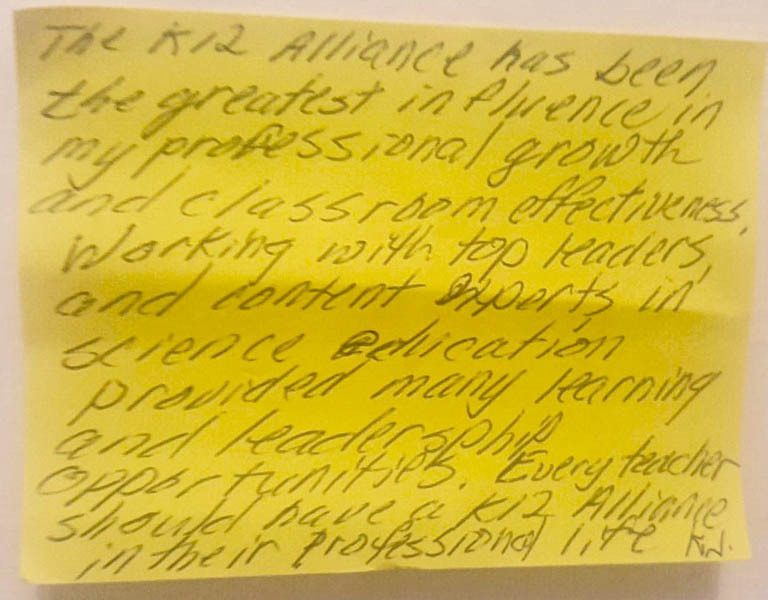 The K-12 Alliance is transforming instruction and giving opportunities to build teacher leadership on my site. Collaboration with colleagues from across disciplines, and sectors enabled me learn, apply and to integrate NGSS science standards in my practice. The most exciting piece for me was the application of Science and Engineering Practices into my lessons. 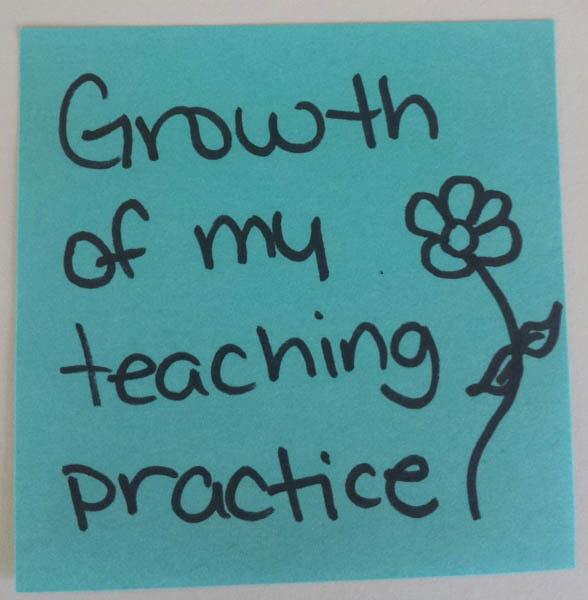 K12 has reinforced my belief that collaboration among teachers is important and how reflection and evaluation of lessons and student work are necessary for both student and teacher growth. 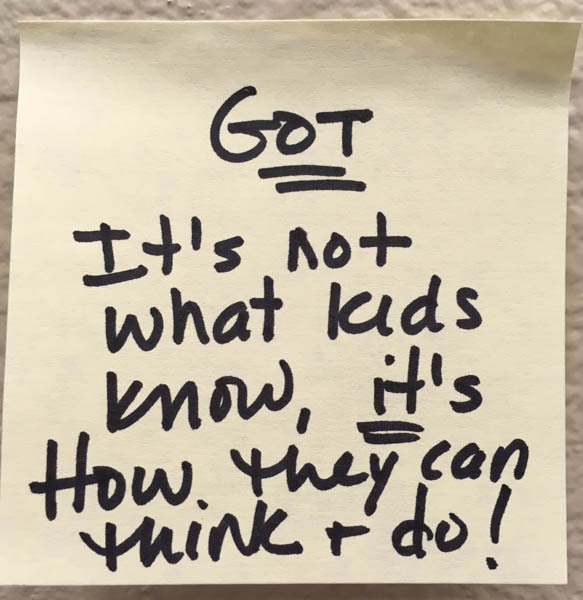 When the students are the ones doing the sense-making, the learning is richer, and 'stickier'......kids hang on to the understanding more when they learn through exploring. The K-12 Alliance has supported my teaching science in my community in a variety of ways. They have helped me grow and develop my leadership skills. They provide me with valuable professional development on how to speak to my colleagues and community members about the importance of quality science instruction in our classroom. 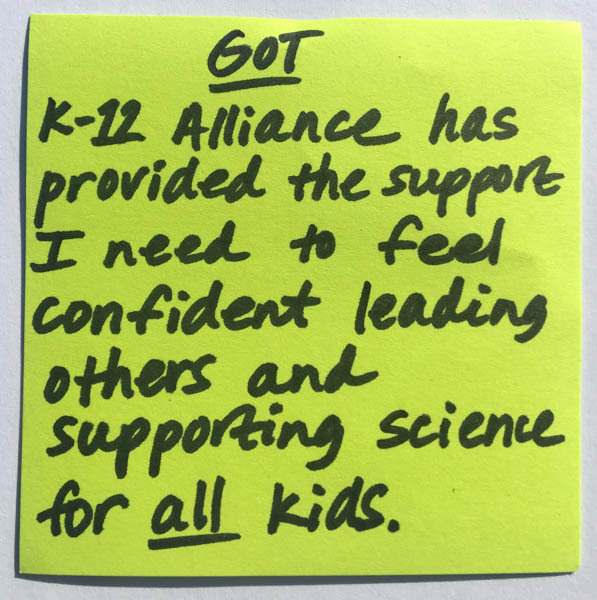 The K-12 Alliance has also given me the tools to understand the importance of having conversations with the community members on the implementation of the CA NGSS. NGSS Project Prototype was a fantastic opportunity to gain experience with NGSS in all aspects. I am the current Department Chair at a Middle School with almost 1500 students and 14 science teachers (including two special ed). We are about 80% free and reduced lunch. We were able to change to an integrated model. I was a total neophyte as to engineering and teaching some new content areas. We were able to develop new worthwhile lesson modules when we were unable to find them, basing them on real life phenomena and apply the CCC's and SEP's to them. These lessons and their application to hands-on, real life experiences have greatly engaged the students and helped them to achieve greater academic success. The opportunity for collaboration with peers across the spectrum was invaluable. I am very glad that I did this program. KUDOS to all involved! K12 Alliance pushes educators to think deeply about what makes meaningful experiences both for students as learners and teachers as learners. The heart of K12 Alliance is centered on doing the right work the right way (and having some fun and laughter along the way). Lesson studies, at the heart of the K12 Alliance work, focused on high-level collaborative norms, best-practices in instruction, and evidence-based analysis of instruction. 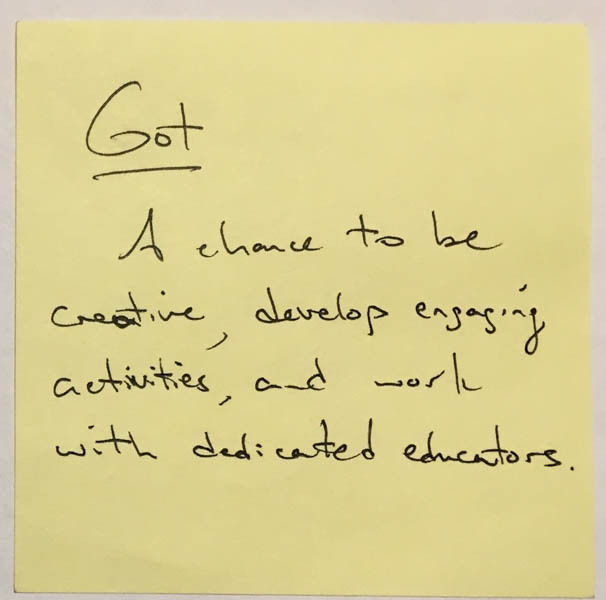 This allows teachers to build positive, highly-effective personal and professional connections with each other while simultaneously giving teachers the space and the challenge to do what really works for student inquiry and learning. 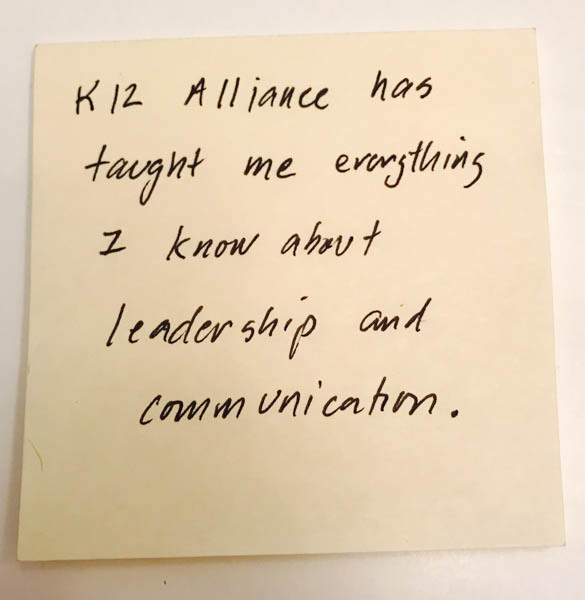 For Dublin, K12 Alliance allowed us to build deep relationships around a common learning experience and then supported us in using both to revolutionize the way we do science across the grade spans.